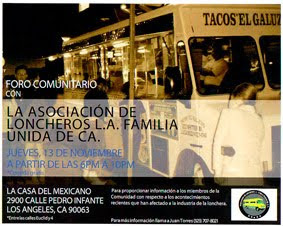 Great article on the taco truck business. "Los Angeles is the hub of this culture, and as the tender nursery to the taco-truck world, it is responsible for its gradual expansion into the rest of the country." Truer words have not been written my friends. The taco truck scene is exploding all over the country and Los Angeles is the taco capitol. Much like LA there are taco truck clampdowns happening everywhere from Lodi,California to Austin,TX to Raliegh, North Carolina. There is a wave of unchecked aggression against the taco culture. On the surface it's just a bunch of whiners that aren't copasetic to the taco lifestyle but in my opinion there are nativist elements at play also. "nativist elements"...OH, yeah. and jeebus am I sick of paranoid white men afraid of brown (and other-colored) people. I can't even listen to talk radio for all of the racism. heck with all that, though. I hope it's like dinosaurs thrashing in the mud as they're being evolved past. oh, and Bandini...? GO TO CHEO'S. oh...my...god. it is SO good. Disbelievers know not the way of the taco. For the taco is the genesis of all taste of goodness. It is the taco that brings mankind together. Baren street corners at all times of day fill with the sounds of joy. The taco is, what the hot dog once was. The taco was once a hidden delight. 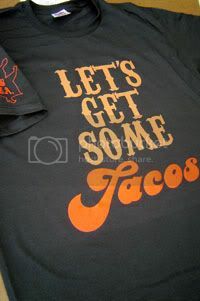 The taco will be on everywhere.
. . . very soon. Los Angeles may be the capital of Taco Trucks but when I was going to school in Austin there was a place called Midnight Tacos. They had a restaurant location but really they were all about the mobile truck. You would call them up and they would dispatch a truck to come and cook in front of your house. The best home delivery service ever. interesting...austin has a pretty good taco scene from what I've read. Midnight Tacos, We Know You're Hungry! My name is Kevin and I am the guy that built and ran Midnight Tacos. I'm proud I live in your memories.